Yeah, to quote the Green Day song, I am desperate for Spring. But I'm not hopeless because I made "Spring for dinner" tonight. I've noticed a lot of food bloggers eating Springish lately as if we can will Spring into being here. This picture is poorly focused but I had to use it because it's the only one I took because this was a quick weeknight dinner. 1. Preheat oven to 425°. Snap off and discard tough ends of asparagus; remove scales with a vegetable peeler, if desired. 2. Stir together 1 Tbsp. olive oil, 1 1/2 tsp. chopped basil, 1/2 tsp. lemon pepper, and 1/4 tsp. salt in a large bowl. 3. Add asparagus to olive oil mixture, and toss gently to coat. Place asparagus on a lightly greased baking sheet. 4. Bake asparagus at 425° for 13 to 15 minutes or to desired degree of tenderness. Cool 10 minutes. 5. Whisk together balsamic vinegar, garlic, and remaining 7 Tbsp. olive oil, 1 Tbsp. basil, and 1/4 tsp. salt. 6. Toss together tomatoes, bell pepper, onion, and 1 Tbsp. balsamic vinegar mixture. 7. Arrange lettuce on individual serving plates. Top with tomato mixture and asparagus. Add avocado just before serving. Drizzle with remaining balsamic vinegar mixture. Note: To make ahead, toss together tomatoes, bell pepper, and onion without dressing. Store these ready-to-use ingredients in an airtight container in the refrigerator up to five hours. 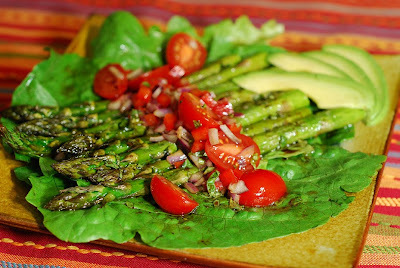 The dressing and asparagus can also be made up to eight hours before serving. We couldn't get bibb lettuce at two stores and went with romaine lettuce. Even the romaine was less than ideal quality. It was tough and a touch bitter. Did I mention I'm ready for Spring? But Alexis and I both really like the contrast of the warm roasted asparagus in a cold salad. The simple vinaigrette went perfectly with this salad. Alexis said she'd love this recipe without any lettuce at all, just the asparagus and toppings. This recipe would be a nice opener for dinner or just as dinner itself. Is there a dish that screams "Spring" to you that you have made recently just to get yourself in "Spring Mode"?